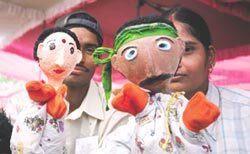 Gyani Baba (wise saint, literarily), a seven feet-tall puppet with handle moustache, is up for a big task in Rajasthan's Ajmer district. He is teaching the importance of good governance and asking people to fight drought. Immensely popular, Gyani Baba has already travelled to around 100 villages. But he can't rest. "Because the folk media has found a new role and is proving effective in it," says Manjulata Rankawat, a folk artiste from Rajasthan and the voice behind Gyani Baba. One of the 500 folk artistes who have come together for the first time to assess folk media's role in ensuring good governance, Manjulata is optimistic: "Folk media is powerful at the grassroots and can better spread messages." The national convention of the folk artistes, organised from September 8 to 11 in Narnaul, Mahendragarh district, Haryana, was arranged by Delhi-based Society for Participatory Research in Asia (pria). Folk groups are already employed in villages to spread awareness about different welfare programme. In Rajasthan, for example, these groups are major campaigners in the right to food as well as the literacy campaign. This was the first time, however, that groups from 12 states came together to assess and plan for their role in ensuring transparent and accountable governance at the local level. Being popular, and in most of the villages the sole source of entertainment, these groups find it easy to communicate with the villagers. "Ours is the most neutral medium in the village. We communicate very independently without any biases," says Pushkar Mahato, a folk artiste from Ranchi who is now in the process of campaigning for early panchayat elections in Jharkhand. Starting from empowerment of gram sabha (village council) to drought relief, folk artistes are increasingly being used as communication tools in a range of campaigns. The advantage with folk artistes is that they focus on specific problems of the villages they usually operate in. "This makes them the most decentralised campaign medium," says Manoj Rai, a programme officer with pria. "Their mainstay is the village resource and its equitable use," he adds. Financial disabilities do little to limit their efforts. "We are not entirely into charity, but if spreading social messages along with our livelihood is possible, we are for it," says Mahato. pria estimates that every village has a formal or informal group of folk artistes. About 70,000 such groups are functional in its network of villages in 22 states. "The national convention is to network all these groups to create the largest decentralised pressure body for good governance in the country," hopes Rai.